“We’ll take you nowhere and show you nothing,” said a tour operator’s brochure at the entrance to the Richtersveld National Park. Hogwash. 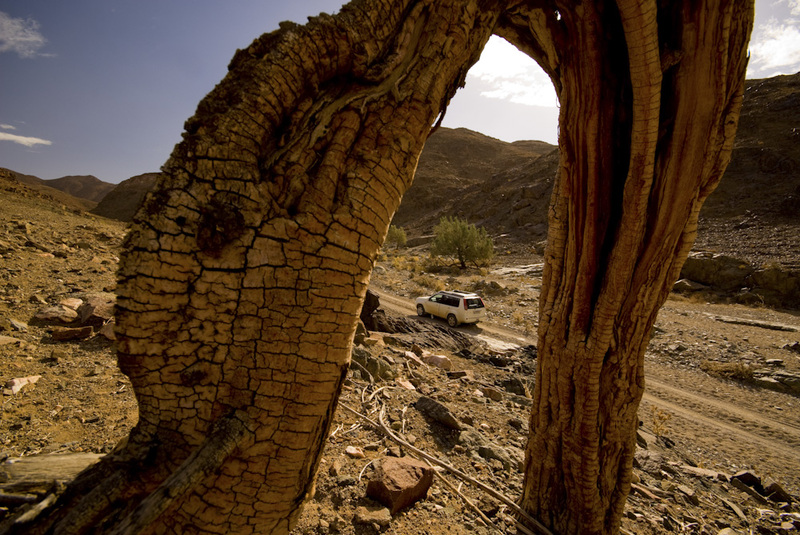 There are remarkable things to see in the Richtersveld. And now that you can cross the border at the park gate to reach |Ai-|Ais and the Fish River Canyon, the Richtersveld is no longer the middle of nowhere. By Alison Westwood. How would you prepare for the end of the world? We went to the supermarket and bought a trolleyful of instant pasta meals and 40 litres of water. Then, since the end of the world wasn’t about to arrive in Cape Town, we packed the water and the pasta meals into an X-Trail and drove north up the N7. Almost 900 kilometres later we stopped the car, got out and gawked. The sun hung low in a sky grey with haze. Jagged black mountains floated like ominous icebergs on a sea of sharp pink gravel. The road stretched achingly towards its vanishing point, then snapped. A hot wind blew sand and silence into our shoes. This, then, was the Richtersveld. The far northern end of the northern Cape pushes up against the green vein of the Orange River as a spiky mountain desert. Inland, it bakes to 50°C on summer days and freezes on winter nights. The Orange River, known locally as the !Gariep, or Great River, is one of very few permanent water sources, an improbable emerald oasis between scorched slopes. Ironically, this life-giving watercourse has also brought a blight on the land: blink klippies – diamonds. Since alluvial diamond deposits were discovered in 1925, diamond mining has etched massive scars across a frangible landscape. Scars that it’s been estimated would cost over R1 billion to remove. Although long overlooked, the Richtersveld harbours riches greater than diamonds in its extraordinary biodiversity. The harsh environment and a multitude of different ecological niches have produced a hoard of rare and endemic plants. The idea to create a national park to protect these living gems sprouted in 1975 but only flowered 16 years later when the Richtersveld National Park became South Africa’s first contractual park (meaning that the land is managed by Sanparks in agreement with its owners, the Richtersveld community). At just over 162,000 hectares, it’s a relatively small park, but across the river lies the |Ai-|Ais Fish River Canyon Park, almost three times as large. The two parks were joined in 2003 to form the |Ai-|Ais/Richtersveld Transfrontier Park. And at the end of 2007, an old pontoon ferry at Sendelingsdrift was refurbished to create a link between them. As we braaied Karoo wors on the veranda of our mining cottage that evening, we could see the pontoon hauled up on the Namibian side of the river. In a few days, we’d float across on it. Before then, we had some exploring to do. South of the park is the Richtersveld Community Conservancy, sparsely inhabited and unblemished by mining. It’s here that you’ll find the tiny towns of Koeboes, Eksteenfontein, Lekkersing and Sanddrift, the last remains of Nama culture. Here people still practice transhumance (semi-nomadic herding) and build the |haru oms (traditional reed huts). Koeboes was one of the first permanent settlements in the Richtersveld, thanks to its Rhenish missionary church. It’s also the closest town to Sendelingsdrift, so we decided to pop in for a chat and a cold Coke. On the way back, we’d stick our necks down the Wondergat, or Mystery Hole – a 20 metre vertical sinkhole near Cornellskop, that locals believe is inhabited by the Great Snake. Unfortunately, nobody in Koeboes wanted to talk to us and the cafe there had run out of cool-drinks. As for the Wondergat, the real mystery seemed to be its whereabouts, which we never solved. But we did find a hitchhiker who told us about life as a boilermaker on the mines (very hot) and a mining store where we were overjoyed to find ice-cream (nice and cold). All our sightseeing hopes for the day were now pinned on the Hand of God. About 15 kilometres inside the park, we found a boulder with a clear impression of a huge hand standing by the side of the road like a stop sign from the Stone Age. Reassured by the fact that we had at last tracked down something on the map, we headed for a campsite appropriately named De Hoop (Hope). To reach it, we had to cross the Akkedis Pass, so called because its steep route and sharp turns are reminiscent of the way a lizard walks. It was wrong, of course. Just before I gave up hope, a shimmer of green trees leapt out from ashen peaks. The river! A tidy ablution block tucked between tamarisk trees was the sign that we’d found the campsite. We pitched our tent on soft sand in the shade of a sweet thorn and slid bare feet into cool mud. Our campsite companions were cunning river crabs, bustling bulbuls and innumerable fish, which nibbled our toes when we swam and left tantalising ripples when they jumped. Later, as our fire died down, the stars came out and sang soprano lullabies, but by then we were fast asleep. Dawn comes swiftly in the Richtersveld, and with it, sheep and goats. Hundreds ran bleating through camp the next morning, a novel and effective alarm clock. We drove back into the parched wilderness while the air was only bath temperature. When we reached the chalets at Tatasberg just after ten, it was already back to volcano level and we spent the rest of the day taking cold showers, fully dressed. Still, the morning’s drive had opened my eyes to the desert. Far from being dull and featureless, every bend in the road brought something of wonder. The white skeleton of a shepherd’s tree, twisted like a botanical contortionist, stood alone on a vast rusty plain against a backdrop of burning stone. A giant eagle owl sat quite still on a ridge next to the road and regarded us with scholarly disdain. Black eagles and jackal buzzards spiralled low over scrub; one dropped a feather from its wing as it flew and I ran to fetch it. A wild cat slunk across a hillside under the ghost of a full moon, then vanished like a ghost herself. An army of sawtooth mountains marched into the morning mist. Everywhere were strange plants. Huddled on a lonely hillside, a few sad halfmens had lost their hair and their homeland. Standing proudly above a mass of tumbled boulders, a quiver tree saluted the sun. Desert broom caught its sparkle in a thousand fluffy seed pods. Leafless botterbooms squatted stoutly like dwarf baobabs. Hidden in the pebbles were the shy living stones of lithops, outshone by showy vygies opening for a day’s haggling over insect attention. And on our way out of the park the next day, near the top of the Helskloof pass, a host of golden and crimson Pearson’s aloes paraded down the hill with us. It was easy to leave the Richtersveld. All we had to do was drive down a ramp and onto the pontoon. Ten minutes later we were in Namibia, without having had any reason to use the lifejackets provided. As we sped along the smooth dirt road next to the Orange River, we discovered another way to see the Richtersveld National Park – from the |Ai-|Ais National Park. On this side of the river, the visual impact of a wall of ferocious mountains stabbing at a rainless sky can give you goose bumps, despite the heat. So can the Fish River Canyon, when you stand on the edge looking half a kilometre down to where the silver trickle of the Fish lies like a lost necklace. I slipped; adrenaline surged, and I saw I had been mistaken: this wasn’t the end of the world, it was only the edge. But that was its whole appeal. A life at the limits of possibility can be more compelling than one of comfort. Daring death and cheating extinction makes you more alive. And it’s not just humans who feel this. The plants and animals of the desert must know it too. Richtersveld National Park Take the N7 past Springbok and turn left onto the R382 just after Steinkopf. Continue for 95 kilometres to reach Port Nolloth. There are two possible ‘short cuts’ off the R382, on dirt roads past Eksteenfontein or Lekkersing, but it’s quickest to take the tarred road from Port Nolloth to Alexander Bay. From there it’s another 87 kilometres on a decent dirt road to Sendelingsdrift and the Richtersveld National Park. Ai-Ais and Fish River Canyon National Park At Sendelingsdrift, cross the pontoon and turn east at the park entrance a few kilometres after the Namibian border post. This road (the D212) will take you towards Noordoewer, but turn left at the sign to Grünau to link up with the D316. To get to Hobas and the main Fish River Canyon view point, turn right onto the C10, then left onto the C37. The roads are dirt, but very good, so the whole drive only takes three hours. The water at the Richtersveld campsites and at Gannakourieb is not good for drinking. You’ll need to take enough for cooking too (at least five litres a person a day). Even if you’re not camping, make sure you have plenty of water for the road. There’s a basic shop at Sendelingsdrift and a well-stocked shop at Baken, but it’s best to take all your food and firewood with you. If you’re staying in the Richtersveld for more than a couple of days or using unleaded petrol, take extra fuel tanks. The petrol station at Sendelingsdrift has only lead-replacement petrol and diesel. You can fill up with unleaded at the mining settlement at Baken, about 40km from Sendelingsdrift (opposite Sanddrift) or in Rosh Pinah, 20 kilometres north of the gates of the |Ai-|Ais Fish River Canyon Park. Get hold of a detailed map of the park and surrounding areas. The InfoMap of the Richtersveld includes GPS co-ordinates and an aerial photograph. The park’s official information guide is R35 at Sendelingsdrift and includes two maps. Be warned, however: we got lost for over an hour between the R6 and R7 way points and suspect both maps need updating. Posted in Feature articles, Namibia, South Africa, Southern AfricaTagged 4x4, ai-ais, desert, fish river canyon, Namibia, richtersveldBookmark the permalink.